As Margaret Meade observed, a small group of people can change the world. 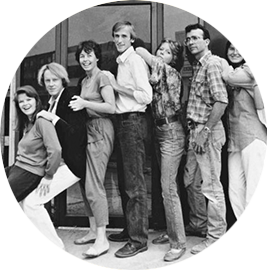 In early 1983 nine unemployed people decided to open a natural food store called The Big Carrot in the east end of Toronto. After seeing The Mondragon Experiment they chose to structure The Big Carrot as an employee-owned company. This would ensure that the workers/owners had an equal voice in decision making and were equally invested in the business. Within two years the store on the south west corner of Danforth and Hampton was too small. 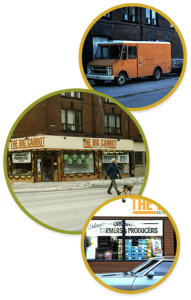 An unlikely partnership with developer David Walsh, customers’ investment and loans from the Federal Business Bank and the Co-operative Resource Pool of Ontario, enabled The Big Carrot to obtain 1/3 ownership in the small development and expand. Built across the street from the original store the mall was designed to fit into the neighborhood by architect, Paul Ruber. At that time it was agreed that 1/3 of any business profits from the real estate would go into a small foundation called Carrot Cache Community Resources Inc. Carrot Cache is a model showing how business profits can be used for community building and to further long term agricultural and food security goals. Over the last 8 years Carrot Cache granted over $1 million to over 165 organizations and individuals. It invested $65,000 in non-voting shares in other co-operatives and loaned and received back over $243,000. These monies are given to people who are working on organic agriculture initiatives and developing regional food economies. Carrot Cache is interested in growing the sector and sustaining the web of connections necessary for long term success. At the same time Carrot Cache supports groups interested in social justice and food security.